I recently had a request to write about a sea mammal, so today I am writing about the West Indian manatee. These huge animals grow up to 4 metres long and can weight up to 1,500 kg, making them the largest of the three species of manatees. Many years ago, sailors who had been at sea for too long mistook these guys for mermaids, with their flat tail confusing them. They must have been very ugly mermaids! They eat a wide range of plants in the water, diving for about three minutes at a time. Their diet gives them a lot of gas which makes them float, but they have very heavy bones to help them dive. They actually have claws at the end of their flippers that they use to dig up and hold their food. They have very unusual molar teeth that emerge from the back of their jaw and gradually move towards the front to replace the older, worn teeth. 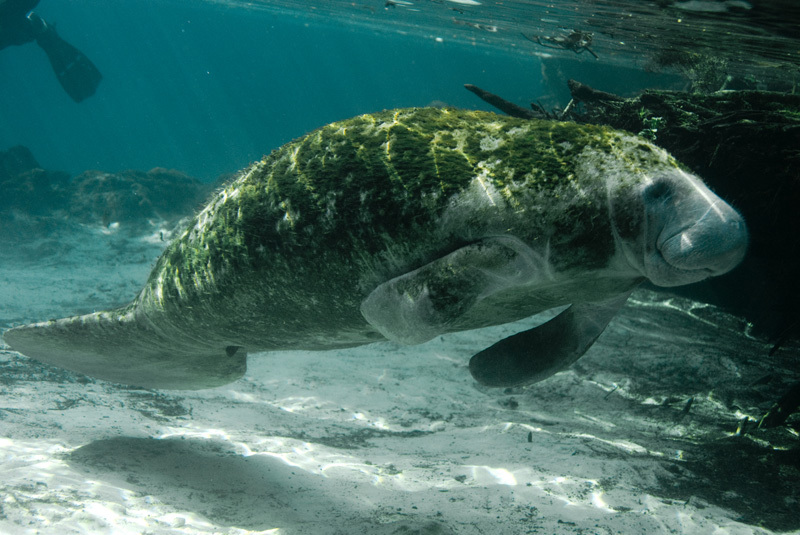 West Indian manatees are found in shallow warm waters near river entrances and estuaries. They range from Florida down throughout the Caribbean. They also migrate further north during warmer weather. They used to be hunted, but now the biggest danger is collisions with boats, which kills a lot of them every year. Are there any other interesting facts that you would like to share about West Indian manatees? I thought that manatees and dugongs were the same! 🙂 That’s interesting!